Address: 8314 S. Old Oregon Inlet Rd. 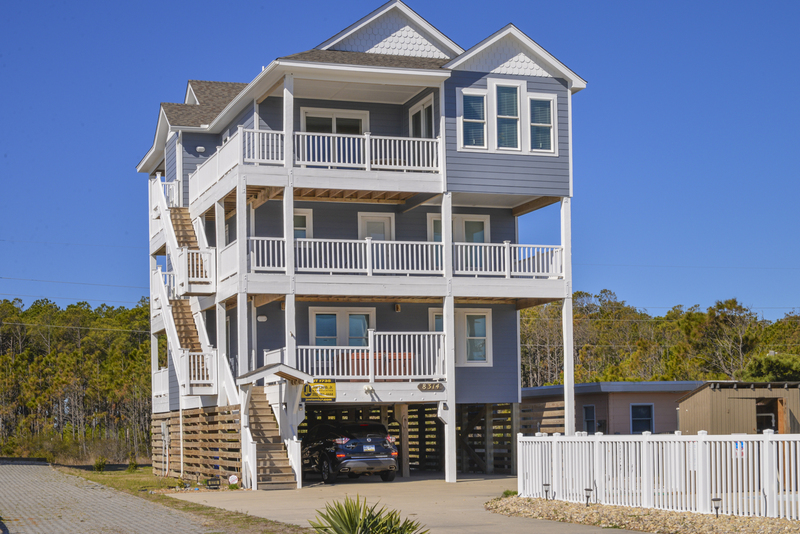 Livin' The Dream is a fantastic Outer Banks vacation home that provides ocean views, lovely decor, hardwood floors, & multiple decks for relaxing. The Private Swimming Pool is sure to be a hit w/ everyone in your group & after a day on the beach, take a dip in the Hot Tub & watch the moon rise above the Atlantic. This home boasts an open floor plan that allows the whole family to gather in style & & provides level of comfort that is sure to please. 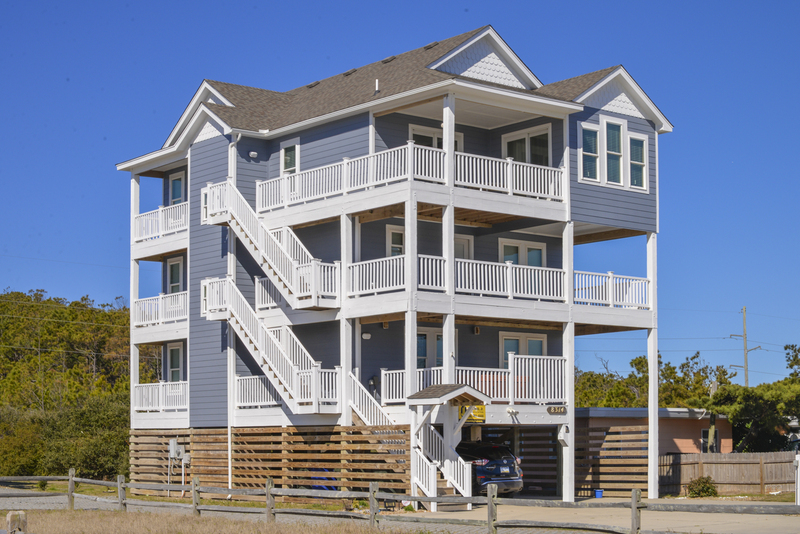 Located in the peaceful community of South Nags Head where sidewalks allow for convenient access to the Beach (350 Ft. to Beach Access), biking, & just a short drive from both upscale & traditional dining, shopping, & entertainment venues. Bordering on the Cape Hatteras National Park (an undeveloped natural area), your family will be thrilled w/ the Ocean to Sound Views & the Tranquility this home offers. Close to the Bodie Island Lighthouse of Pea Island & the Cape Hatteras National Seashore, Oregon Inlet & the Oregon Inlet Fishing Center, Jennette's Pier, The Outer Banks Fishing Pier, historic downtown Manteo, The Lost Colony Outdoor Drama & the North Carolina Aquarium. Ground Level: Parking for 6 Cars, Carport, Private Swimming Pool (Can Be Heated for $125.00 Per Week, Plus Tax - Please Bear in mind that Pool Temperature is Subject to Outside Temperatures & Conditions), Picnic Table, Fish Cleaning Station, & Enclosed Outside Shower. Level One: Large Den w/Dry Bar w/Refrigerator, HDTV, DVD, 2 Bedrooms (1 w/Queen, Flat Panel TV, & Private Patio, & 1 w/2 Bunk Sets & Flat Panel TV), Shared Full Bath, & Covered Deck w/6 Person Hot Tub. Level Two: 3 Bedrooms (Master Suite w/King, Flat Panel TV, Full Bath, & Balcony w/Ocean Views, 2 Master Suites w/Queen, Flat Panel TVs, & Full Baths) & Laundry Area. Top Level: Large Open Living/Dining/Kitchen Area, Seating for 16 People, HDTV/DVD, Electric Fireplace, Hardwood Floors, Awesome Ocean Views, & Master Suite w/King, Flat Panel TV, Full Bath w/Oversized Tub, & Private Balcony w/Ocean Views. Features include: C/AC & Heat, Washer/Dryer, 2 Dishwashers, Microwave, 2 Refrigerators, 2 Phones, DirecTV, 2 HDTVs, 4 TVs, 2 DVDs, Stereo, Wireless Internet, Baby Equipment (High Chair & Baby Gate) Ceiling Fans, & Deck & Pool Furniture. No Pets. This is a Non- Smoking Unit. We loved our stay at Livin The Dream! The place is beautiful. This is a nice cottage. Would recommend it to others. The homeowner had everything marked very nicely so you knew right away where everything was. I would stay there again. We really appreciate all the little extras in the house. Like pillows and beautiful porches. Enjoyed every minute of out stay. Livin the Dream is a beautiful, fully equipped beach home that was a perfect vacation option for our large family. We enjoyed the proximity to the beach access, the pool, hot tub and the fully stocked (very organized) kitchen. Nice home, convenient to Jeannette's Pier. Every aspect about your gorgeous home was perfect. Extremely organized, which satisfied my OCD, roomy, and beautiful view. It was a beautiful decorated. Very clean & welcoming. It was close to everything we wanted to see & experience.